The Rocca Aldobrandesca of Castiglione D'Orcia is first documented in 714 when it was a possession of the Aldobrandeschi and was known as Petra. In 1252, it became a free municipality but its independence lasted no more than a century. In 1274 it became a part of the County of Santa Fiora with the breakup of the Aldobrandeschi territories. During the 14 C, it became a Siennese possession and in return for financial favours was conceded to powerful families, including successively the Piccolomini and the Salimbeni. The latter used the Castiglione d'Orcia itself as one of their bases for their revolt against the Siennese. Later, Castiglione d'Orcia passed into the hands of the Florentines who in 1605 entrusted it to the Riario, a family of Bolognese nobles. 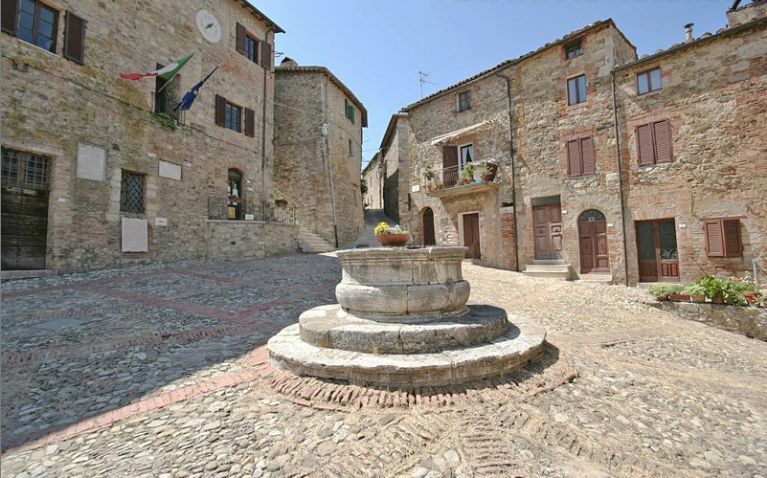 This festival takes place in late October in the small village of Vivo d'Orcia. Various competitions, buffoonery and so on take place, and there is a nature walk where mushroom species are explained, but the main attraction is the range of local porcini mushroom dishes available, and the sale of porcini and chestnuts. The Piazza il Vecchietta in the centre of town is dedicated to Lorenzo di Pietro (1412-1480), called "II Vecchieta", who was a painter, sculptor and architect. At the centre of the square, there is a beautiful fountain in travertine dated 1618, and the Municipal Palace on the square houses a Siennese school fresco of a Virgin Mary with Infant Jesus and two Saints. A walk through Castiglione should also include a visit to the Romanesque Church of S. Mary Magdalena, which has been restored recently. Its facade dates back to the 13 C, while the apse is 12 C and it has a fine bell tower. The Church of Saints Steven and Degna was the most important religious building in Castiglione, based on the number of works of art that it contains, even though its interior is not particularly interesting. Its facade dates back to the 16 C and it contained a Virgin Mary with Infant Jesus (later than 1320) by Simone Martini and another Virgin Mary with Infant Jesus by Pietro Lorenzetti, both now in Siena. One of the main reasons to climb to the top of the Rocca is to take pictures of the highly photogenic Rocca d'Orcia a few hundred meters away. The sloping Piazza il Vecchietta with its travertine fountain.